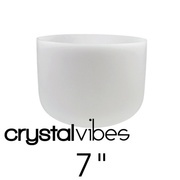 Browse through the brand new selection of Empyrean Crystal Singing Bowls for sale online. Each bowl is hand-selected and then individually recorded. Just click on the item to view more photos and play the sound clip of the actual bowl. Use headphones or high quality speakers for the best sound experience. We have entered the enlightened age! The Crystal Vibes line of Empyrean quartz crystal singing bowls represents the ascension of the classic frosted crystal singing bowl into higher realms of sonic purity. 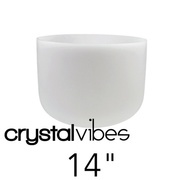 The classic style of frosted quartz singing bowls has been in use by sound practitioners since the 1980’s. The first frosted bowls rose from a humble beginning as cast offs and rejects from the last GE semiconductor factory in the United States to stars of new age music and sound healing practitioners. Let’s be real though, the beautiful sound they make has always been held back by the sound of the striker on the outside of the bowl. Without causing any more friction, the Empyrean design attempts to smooth things out. The exterior of the Empyrean series bowls starts out without the grit of frosted bowls and then is hand-polished to a smooth finish. This level of perfection leads to a smooth-walled bowl that is easy to sing without the distraction of the secondary noise introduced by the playing implement. Empyrean Crystal singing bowls play best with our Crystal Vibes super premium crystal bowl tools and our premium suede singing bowl tools. All suede tools work well with the Empyrean series bowls and many variations of rubber ball tools will work as well. If you have any questions about the Crystal Vibes Empyrean line click here to send us a message!